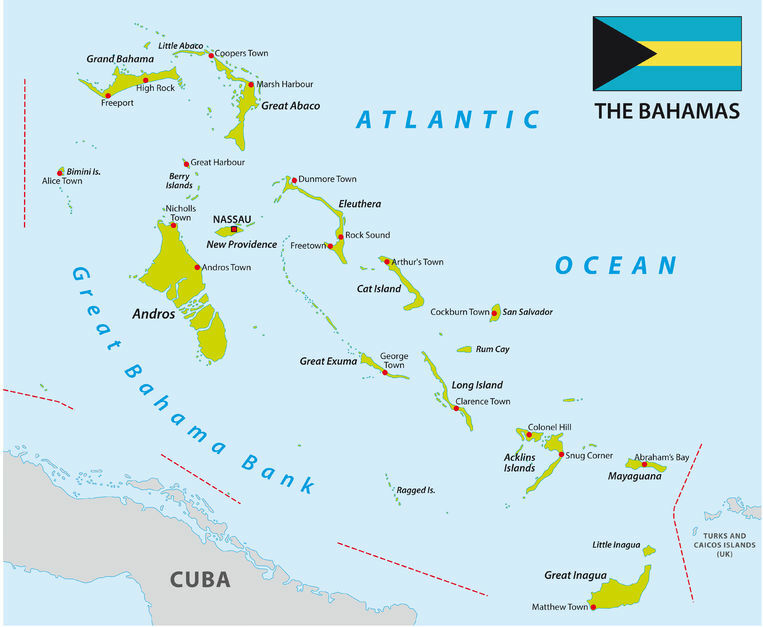 A map of the Bahamas. During my stay in the Bahamas, I lodged on Paradise Island, a tiny island which is just off the northern coast of New Providence and which connects to it via a pair of bridges that traverse Nasssau Harbour. One of those bridges is named for Bahamian actor Sidney Poitier, KBE, who won the Best Actor Oscar for his role in the 1963 motion picture Lilies of the Field. Mr. Poitier, who was the first person of African descent to win an Academy Award for either Best Actor or Best Actress, also served as the Bahamas’ ambassador to Japan from 1997 to 2012. ‪#‎themoreyouknow‬. Formerly known as Hog Island, Paradise Island is most notably the setting for the globally renowned Atlantis mega-resort. I didn’t stay at the Atlantis, but my hotel was across the street from it and I took advantage of that proximity to, among other things, make multiple forays to the blackjack tables at the Atlantis’s casino. 🙂 Incidentally, some scenes from the 2006 remake of the James Bond film Casino Royale (the first film in the series to star Daniel Craig as Agent 007) were filmed at that casino. But I digress. 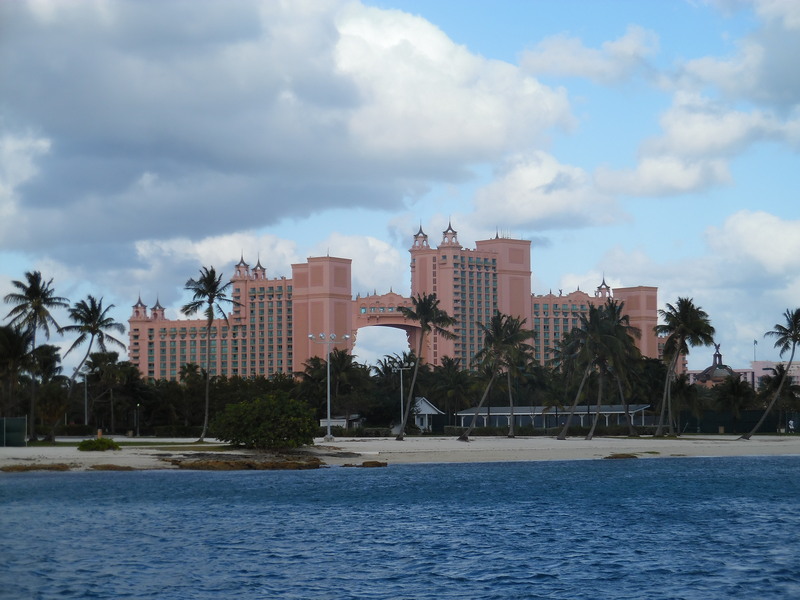 The hotel towers of the Atlantis resort on Paradise Island, as seen from the ferry in Nassau Harbour. 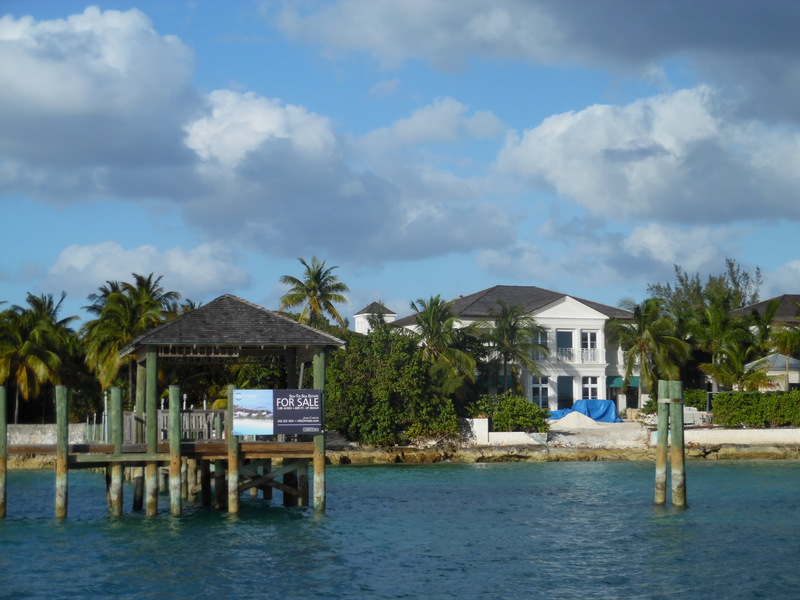 This house on Paradise Island, owned by the actor Nicolas Cage, is currently for sale. I guess he hasn’t been making enough National Treasure movies or something and he needs the money. Nassau’s compact downtown is easily walkable; you can also go on a horse-drawn surrey ride, which offers a great way to gain a quick introduction to the area. (I sprang for such a ride.) A highlight of the downtown is the government buildings with their Georgian Colonial architecture — many of which are painted in a distinctive salmon hue. 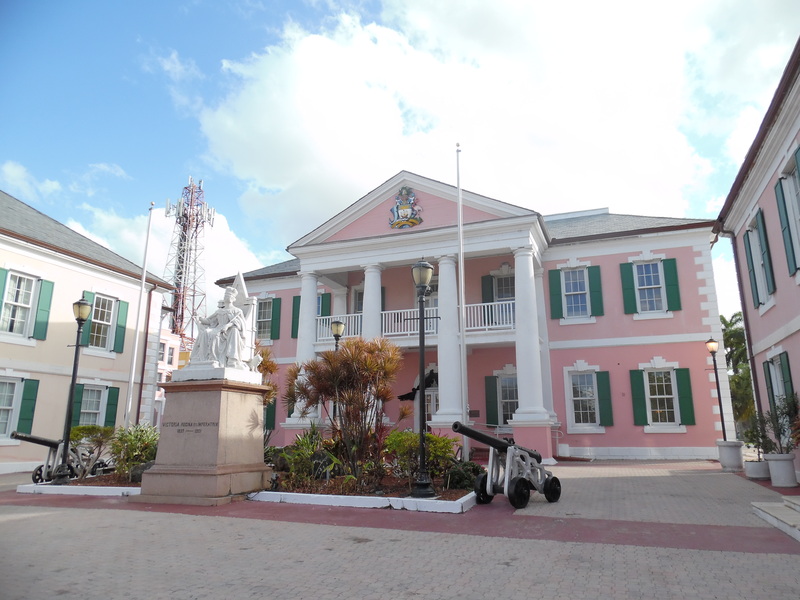 Parliament Square, a focal point of downtown Nassau, features a statue of Queen Victoria, hearkening back to the time when the Bahamas was a British colony. It gained its independence in 1973. 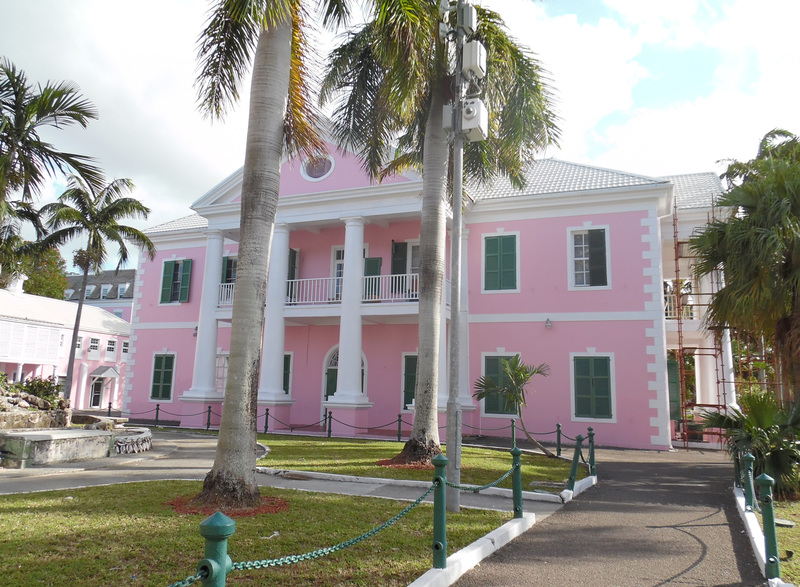 Behind Parliament Square is the Supreme Court of the Commonwealth of the Bahamas. 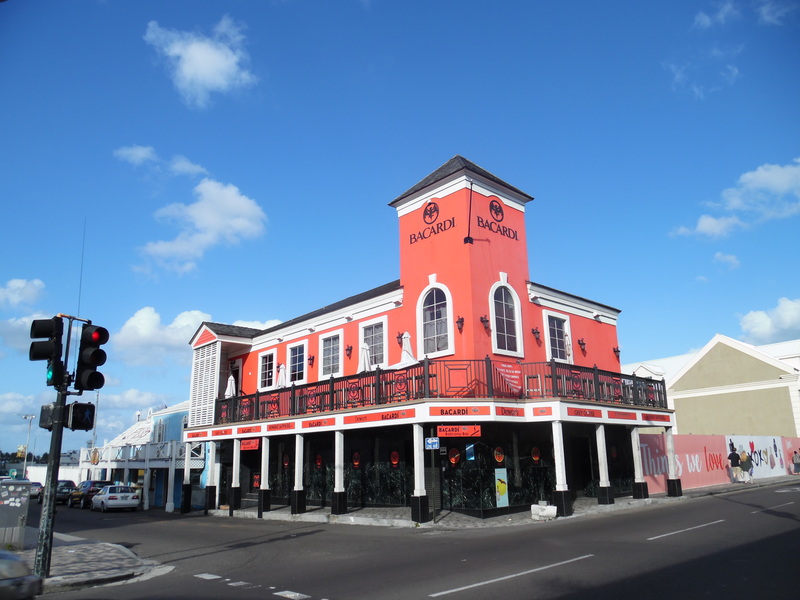 One of my favourite edifices in downtown Nassau is the Bacardi Store, which also contains a bar/lounge in which you can enjoy the eponymous libations that are purveyed on the premises. 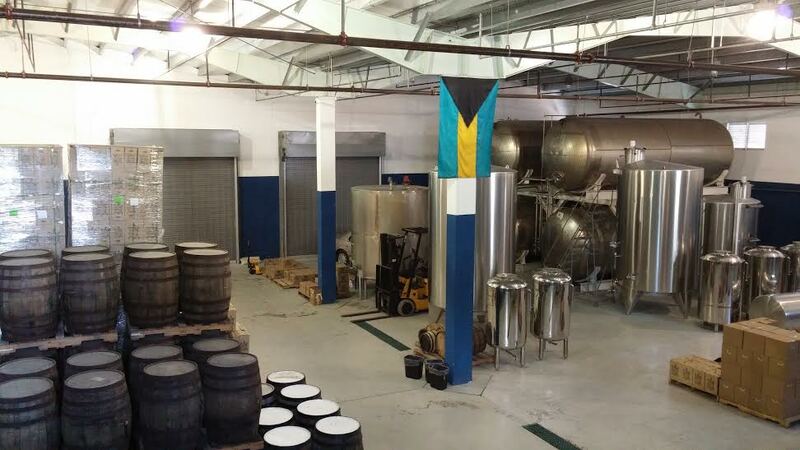 A boutique distillery, John Watling’s takes its name from a 17th century buccaneer and was established in 2013. The founding of the estate occurred much earlier, in 1789, and Buena Vista was put to various uses prior to the opening of the distillery. During the 1960s, the main building on the estate served as a hotel and restaurant that catered to the rich and famous; its roster of guests during that period included the likes of Robert Mitchum, Joan Crawford, Robert F. Kennedy, Eddie Fisher, and Debbie Reynolds. More recently, the estate was one of the shooting locations for the aforementioned remake of the James Bond film Casino Royale. 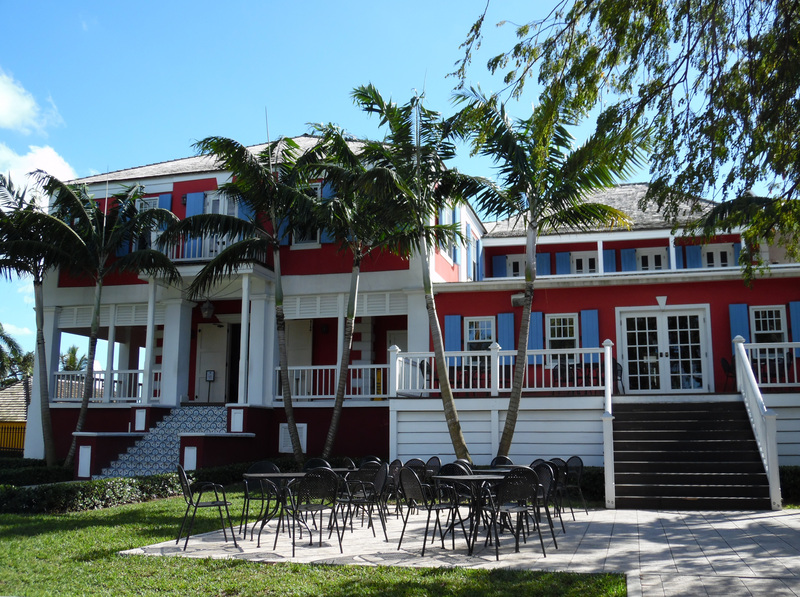 The main building of the Buena Vista estate houses a bar in which you can imbibe John Watling’s rum. In a previous life, the building was a hotel and restaurant that attracted an illustrious guest list. Inside the actual distillery where the product is manufactured. Me about to engage in some rum-tasting in the bar at the John Watling’s Distillery. Rum-tasting on a tropical island in the afternoon — it doesn’t get much better than that! Although if you ask me, singing karaoke on a tropical island in the afternoon is one of the rare things that is even better. 🙂 Speaking of which . . . The watering hole where I made my Bahamian karaoke debut was Señor Frog’s, part of an international chain that also boasts outposts in such locales as Aruba, Las Vegas, and New York City (although I don’t know whether any of its other franchises offer karaoke). 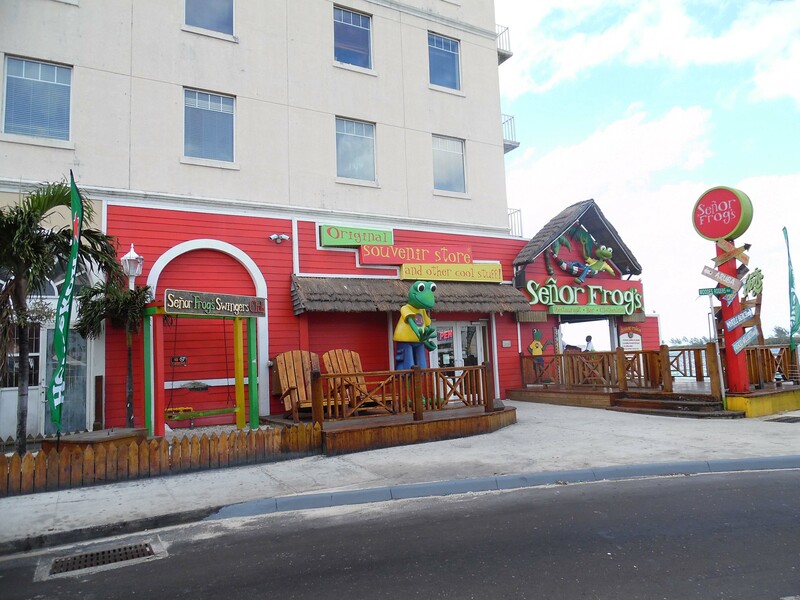 Found along the waterfront in the vibrant downtown, the Señor Frog’s in Nassau is not a typical karaoke bar where you’ll witness a steady stream of singers being summoned to the mic. The way it works is that any patron who wishes to perform can ask the folks in the DJ booth, and they’ll set you up with the number that you’ve picked out from their karaoke songbook. So karaoke performances are sporadic, dependent upon the desire of patrons to partake of that activity. 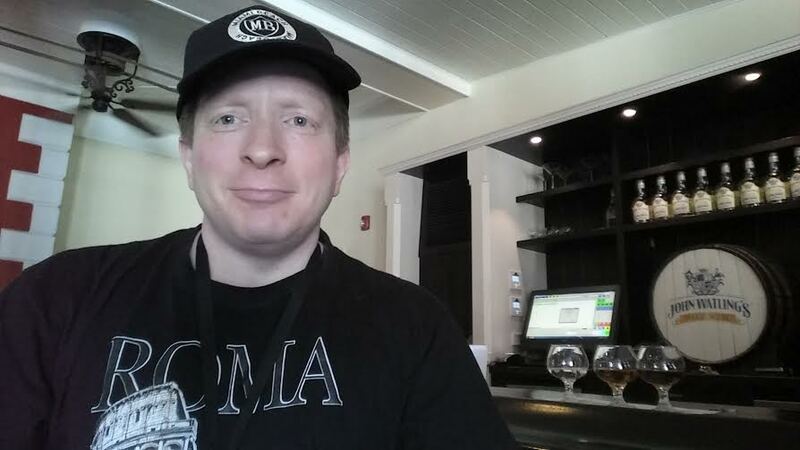 But the opportunity to do so is available seven days a week, all through the bar’s hours of operation (which are nominally 11:00 a.m. to 1:00 a.m., although in my experience sometimes it closes early if the crowd has thinned out). The exterior of Señor Frog´s in Nassau, Bahamas. As you can see, the audience was quite raucous. Even though several hours remained until dinnertime, many of the bargoers were already drunk, because Bahamas. Their over-the-top enthusiasm resulted in a great time for me, the singer. Also contributing to my enjoyment of the occasion: the DJ, Anfernee, who did an outstanding job of introducing me to the crowd and setting things up for my performance. 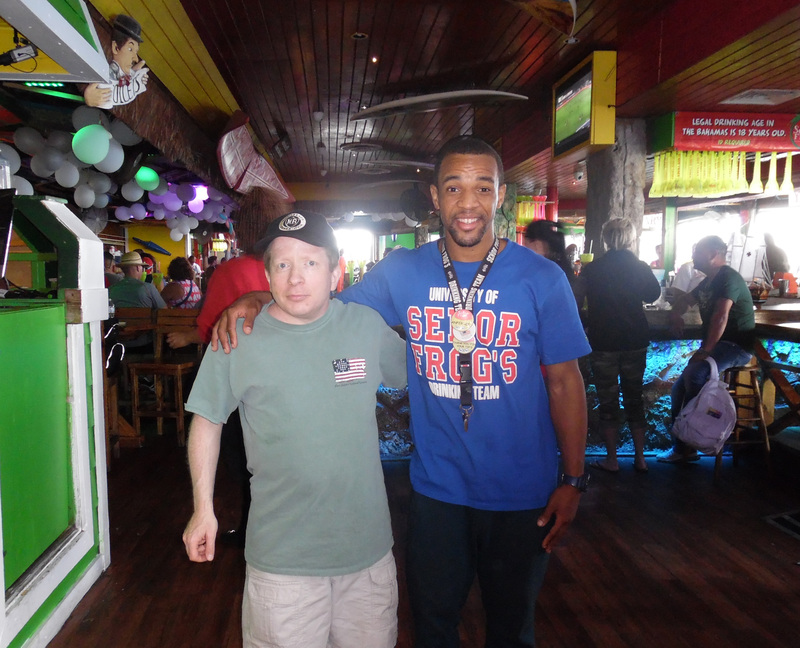 Me with Anfernee, the DJ at Señor Frog’s in Nassau who hooked me up with the karaoke. While singing “Just a Gigolo / I Ain’t Got Nobody” is fun in its own right, I appreciate the song even more after learning about its long history and how it evolved into what you see me performing in the video above. Although many people today are familiar only with David Lee Roth’s version of the song, which hails from the decade of the 1980s, the song’s roots can be traced back to early in the 20th century, and its precursors fall into two separate branches that would later merge. It makes me feel old to think that Mr. Roth’s cover of “Just a Gigolo / I Ain’t Got Nobody,” released when I was a teenager, is more antique now than Louis Prima’s original version was when Mr. Roth covered it. 🙂 It’s pretty cool to me, though, that the song continues to endure, and that even the millennials who were in attendance during my afternoon at Señor Frog’s were totally into the song when I was performing it. I can’t wait to leave for that trip, and I can’t wait to write about it when I get back! 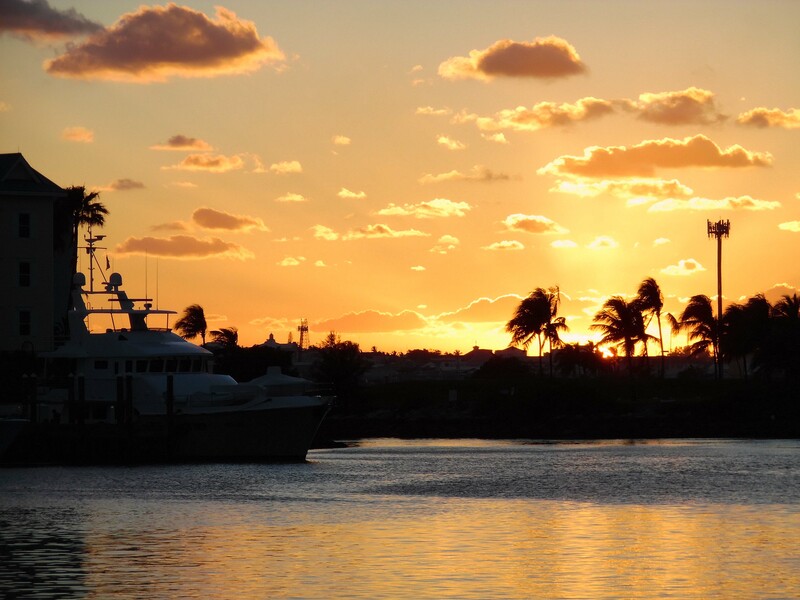 A sunset viewed from Paradise Island in the Bahamas. Do you enjoy visiting tropical islands such as the ones in the Bahamas? What about Prague, Czech Republic? @Exequiel: Hi, and thanks for your interest in my World Karaoke Tour! Sadly, when I was in Prague in 2006, I was unable to find a place that had karaoke on any of the nights that I was there. I would love to get back to Prague — it’s such a beautiful city — and I hope that the next time I’m in Prague I get the chance to sing there! Wow, we never knew that karaoke was so popular worldwide! And the Joel’s Karaoke Uber ride sounds utterly fun (coincidentally, heading to DC soon). For some reason, your karaoke video seems to load a little slowly – could only manage to catch the beginning, when you’re speaking😦 Nassau though, sounds like a nice getaway from the East Coast cold – the downtown especially seems really charming! Is it cheaper to stay in Paradise Island and get to Nassau? Also, is there a beach nearby that you’d recommend? Since my karaoke video was just embedded in the post as a YouTube link, I’m not sure why you had trouble loading it — but I’ll email you a direct link to the YouTube video. Nassau was very charming. As far as whether it’s cheaper to stay in Paradise Island, it depends where you stay. The Atlantis certainly isn’t cheap, although it’s all-inclusive. 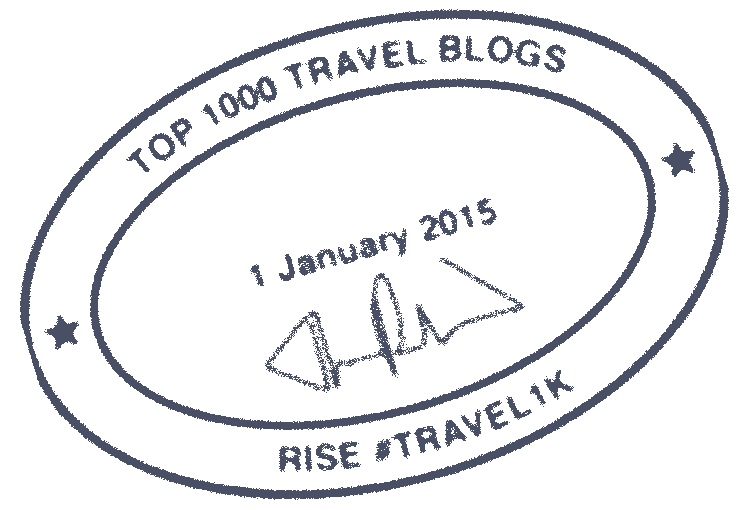 You would want to look generally at hotel listings for both islands and see what kind of deals you can find. I can’t help you out with beaches; I’m not a big beach person and didn’t make it to any during my stay. I know there are supposed to be a lot of good ones around Nassau and Paradise Island, and if I’d been in the area longer I would have checked out at least one of them. But I’m afraid I can’t speak with personal experience about any of them. Karaoke sounds like such a fun way to travel the world and I love how you included the history of your song. I fully support the deviating from the night-time karaoke norm and this whole quest of traversing the globe and making your mark through vocals. And day time rum drinking… you must respect the local customs. 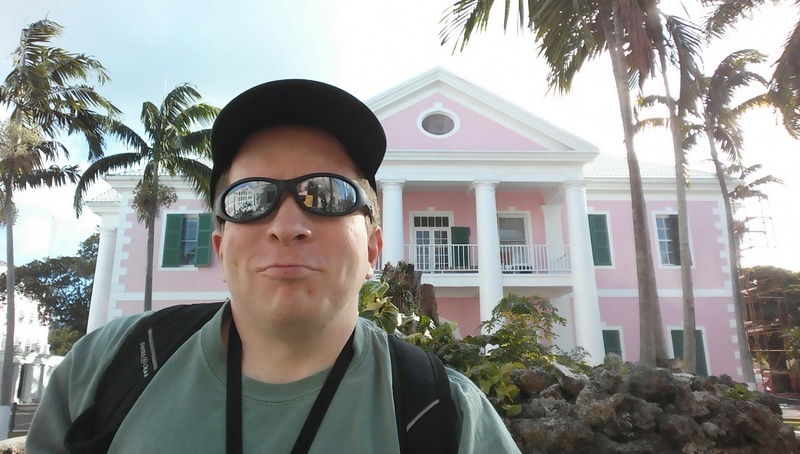 I have stayed on Paradise Island in the past and in Atlantis and had a fantastic time. Unfortunately my visit to Nassau was shorter lived than yours. When you stayed in Atlantis you probably didn’t need to go to Nassau because everything you could have wanted (except for karaoke) was provided as part of the package. Actually there was a place on Paradise Island that had karaoke but only on Friday nights, and I arrived on a Friday night but by the time I checked into my hotel it was too late to go out that night. Sounds like a fun way to travel the world 🙂 I have only done karaoke twice, I think…can’t really remember, lol. I do love the colors of the buildings in the tropics…so pleasing to the eye…and afternoon drinking in the warmth is always a good option (as it snows another 5 inches right now). Do they allow karaoke in North Korea? It isn’t something that I would immediately think of when I think of that country. @faegirl: It is a fun way to travel the world, although karaoke is only one of the things I enjoy doing when I’m on the road. I agree that buildings in tropical cities are often (in my limited experience) colourfully painted. Beautiful images – the Bahamas really is a paradise! And great that you are following your karaoke quest – keep on singing! What a unique angle to travel with! One day I hope to stay at the Atlantis Resort. It looks amazing but it’s sooooo expensive. @Nathan: Thanks. The Atlantis does look amazing, but if you want to spend less money you can stay at the hotel that I did — the Comfort Suites, which is across the street from the Atlantis. Guests at the Comfort Suites get access to the Atlantis’s facilities. Thanks- that’s an awesome tip! OMG! This is so fun! it takes a huge load of courage to stand in the front of the stage, and what more to sing. I think alcohol has done the trick! @Bernard: Actually I drink sparingly when I’m performing, as it’s important for me to stay sober enough to have control of my voice. I drink just enough to help me relax, but usually no more. Fantastic H-bomb! I loved reading all about the history behind the song you chose, I can see how much you enjoy singing and your knowledge of the music you share is fantastic. All the bests for your next 40 countries! @Ilefthome: Thank you for your compliments. Yes, I do enjoy singing, which is why I do it everywhere I go. 🙂 Obviously, most of the songs I do don’t have quite as much history behind them as the one featured in this post (and haven’t been covered by the Village People 🙂 ), but I do enjoy finding out the stories behind various songs. This is my first visit to your blog and i am really delighted tohave found you. A great post on Bahamas, indeed. When are you planning your India tour? @Everything_Candid: Welcome! Thanks for your kind words. Actually, I’ve already visited India in 2014. I’m Filipino so I’m quite familiar with karaoke! haha I’ve never been to Bahamas but it looks amazing. I would love to visit someday. Bahamas? Sweet. Its on my bucket list. Hey have you tried Indonesia for Karaoke? If not, you must – Indonesians love Karaoke and even though I was in a smaller town (compared to Jakarta/Bali) – Bandung – there was a Karaoke bar in almost every street…Plus, everyone can sing there – like “everyone”. @Jo: I haven’t been to Indonesia yet, but I would like to go there. Sounds like a karaoke paradise! But there are so many islands, I would have to think very carefully about which parts of the country to visit (other than knowing that I would want to see Borobudur). This is sooo cool! What a unique way to see and experience the world! You will definitely have to come to Bolivia (especially Santa Cruz de la Sierra) where karaoke is HUGE here. It is THE thing to do on weekends and everyone gets together in specific groups based on what people like to sing. Good luck! @The Bohemian Diaries: It IS a fun way to travel. And be assured, Bolivia is on my list — among other things, to see the Salar de Uyuni, and the old buildings in La Paz and Moon Valley. It’s good to know that I’ll find great karaoke there too! What an innovative way to see the world! Keep on traveling and singing! @Cultured Adventurer: Thanks, I plan to! That was interesting to read. mainly stick to karaoke with my friends and in the kitchen. Another great place to visit in Nassau is the Pirates Of Nassau Museum (http://www.pirates-of-nassau.com/home.htm). Takes about an hour to see it all, and a lot of fun, if you’re into that sort of history. I saw it with my family a few years ago when we were on a cruise that docked in Nassau for the afternoon.